December 2018 was another month for lower gas demand y/y in South Korea, but LNG imports posted a 0.56 Mt (13%) y/y increase, pushing the y/y storage surplus to about 1.8 Mt by month’s end. 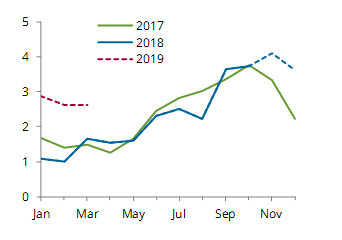 LNG imports should now start to slow given that winter buying is over, but the storage overhang is likely to persist, especially given forecasts calling for a continuation of very mild weather into February. Several tax changes that are meant to boost LNG imports and stimulate gas demand come into effect in 2019, but these changes are unlikely to reverse the losses in power sector gas demand that will be driven by a steady increase in nuclear generation capacity. We forecast that LNG imports will drop by 1 Mt (25%) in January, with Q1 19 imports falling by 2.8 Mt (22%) y/y. 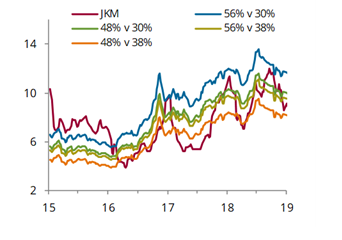 South Korea posted its first stockdraw of the season in December 2018, a small 0.1 Mt draw. The last time that withdrawals began so late in the winter was in December 2015. The combination of milder weather y/y and weaker power sector gas demand, in addition to high LNG imports supported by stronger global supply, has limited South Korea’s need to draw on stocks in the winter 2018/19 season. Aggregate demand was 0.30 Mt (7%) lower y/y at 4.3 Mt last month, although it was 0.18 Mt above the past four-year December average. Similarly to November 2018, milder weather y/y curbed res-com demand compared to December 2017’s high base. December 2018’s HDDs were 5% lower y/y, but 4% higher than the past five-year average. The mild weather that characterised most of Q4 18 has carried into January, with forecasts indicating that HDDs this month will be down by 15% y/y. 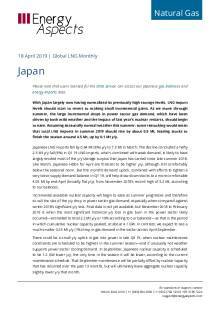 With South Korea having now completed its winter buying, and longer-term weather forecasts indicating a milder-than-normal February, we should start to see a slowdown in LNG imports as capacity holders opt to run down some of the significant y/y storage surplus. Our balances indicate that South Korean LNG stocks ended December 1.8 Mt higher y/y at 4 Mt. We expect stocks to remain in y/y surplus for the rest of 2019, suggesting limited restocking needs. The biggest y/y demand losses in December occurred in the power sector, with gas into power dropping by 0.22 Mt (12%) y/y. Weaker power sector gas demand is likely to remain a theme for most of 2019, with nuclear availability currently scheduled to be higher y/y every month except July and August. Even when there are revisions to the nuclear maintenance schedule—as there have been for January-February, with an additional 0.6-0.85 GW now expected to be offline—the changes are only large enough to merely soften the y/y drop in power sector gas demand, rather than lead to net y/y growth.